Rain and Chills says HI !! People often say "Everything comes to an end" so did my joyride of the Toy Train. Yes, it was soothing to my soul (you heard it right, I am not mistaken its definitely soul, you must try it and I am not exaggerating) but being a human, I wanted more and Shimla opened up the heavens for my welcome. Imagine you are a pahadi, you go to a hill station which you always believed to be overrated and the first step to you put on the land, its chilly with light shower!!! Won't you choke yourself off sheer disbelief that your belief was just proven wrong by a non consensual travel ticket, Imagine that feeling when you can only feel the overwhelm. My Mom always says that I am an overconfident fool and the reality struck me like lightening. I was a fool to live 23 long years without setting my foot to Shimla!! Wonders Old Monk and few good friends could do to you!! Those feeling are impossible to express by pressing keyboard, be there and experience it. August is the time to go. The station comes very close to cleanest place you can see in New Delhi, jokes apart but its beautiful and it has information board with places to visit in shimla as headline. Just when I thought it should be the end of the happiness, I cant have all the happiness in a day. We came out of the platform and the Road from station to Shimla main was a trek in itself. You can just immerse yourself into you past memories while you reach the main roads to shimla.Ever step forward was a flush of chill,rain and happiness. We were on the main street of shimla and it was filled with people crying out loud different tourist spots, cheap hotels etc. People are so same everywhere you go, the slight difference is sometimes language or skin color and yeah culture. We were on a tight budget and the prices were hefty so we decided to take a walk and it was gem of a decision, we met lots of people with different stay plans,travel guides and it gave us the idea of the places we could go in our two day rendezvous to Shimla. Finally we met Mr. Parshuram, who made us drag ourselves to a place which suited our budget and we crashed in small room for Rs.900 for 24 hours (A Christmas offer, you never say NO to). It was calm and peaceful to get a bed to rest upon after a two hour walk to the hotel (yes, we walked for two hour in our hunt of an affordable bedding.) Taking a bath is never easy for me, I am too lazy to do it and if you ask me to take a bath in freezing cold water, I would refuse on your face but it happened and I took a bath and the first meeting of that freezing water with my mortal self was crazy, never felt anything like what i felt during that bath, it woke me up and refueled me. I came out energized and was roaring to explore more. To my surprise, both of my travel mates were too tired and couldn't join me and it was best for me as I was able to experience Shimla with my energized self. I walked out of hotel and felt need of food,so the search of food took me to a guy making snacks roadside in the main market. In my two years of studying in Delhi, I have seen lots of street joints pulling so much of crowd but this was not a street food joint but an old man trying to earn his livelihood and boy he was failing everything I have seen in Delhi. Two queues were waiting for him to make them simple Snack. Snack was available in two variety vegetarian and the omelet burgers. I waited for another half an hour to get my omelet burger and my first bite was convincing enough for me to grab another one and wait of half an hour ( I waited for another half hour to get the second one). It was like devil's food, you cannot get satisfied eating just one burger and it cost me fifty bucks for two. I wanted to get another one but I decided not to get it as people started widening their eyesballs after watching eat two burgers in no time. I thanked him for his creamy burger and moved on for further search of food. Ten minutes further, I found another small food joint decent and clean, so I decided to hop in try some more of Shimla and the food was crazily named, never heard such names for simple things. I ordered "DUBKI GOBHI","DAL-AE-SHAHI with plain rotis (chappatis) and when the guy arrived with my order, "Shimla, you beauty Stop surprising me now or I'll be dead" came out my mouth. DUBKI GOBHI is cauliflower with a thick sauce over it and DAL-AE-SHAHI is fried pulses with all sort of dry fruits.Smell was heavenly and taste was orgasmic,second only to Mom's made GAJAR KA HALWA, I can bet you that.Yes My Mom has magical hands and her GAJAR KA HALWA is to die for. My mom just appeared in front of my table and it was an experience I can never forget. I took half an our to eat my order as i wanted that extend my mom's little cameo to a little longer. After I was done and paid my bill with a tip and I have never done that before ever, it was that great. The food,Mom's cameo increased my craving to see more of Shimla, to be frank I wanted Shimla to keep on surprising me. Walking bit further , I got a call from my friends and I asked them to join me after eating Burger from that joint and food of that restaurant at place which you can find everywhere in India, Tibetan Market. If you guessed it correctly, then you have traveled quite a bit i must say. Tibetan market is like everything it always is everywhere else, Cheap clothes with brand labels, Food, local items, Liquor and crowd, lots of crowd. The place is so crowded that you cant visit every shop even if you wanted to. My friends joined me at aforementioned place, a temple and they decide to go inside and me being me decided to explore market further than to go to a temple (I apologize if this hurts your religious sentiments). People here are another experience to observe, they never raise their eyes ever and unfortunately or fortunately if they even give you a glance you could feel that you have been stripped of your skin & bones deep down to your soul, such penetrative eyes the shimla pahadis have. Scary as it might seem but if you try harder you can see through their souls too and that is what travel is SOUL SEARCHING, atleast for me. After a lot of dives into peoples souls, my friends joined me and we started getting further into the market and the road took us straight to christ church, which is the second largest church of north india. The view of the place in the evening looks stunning and more beautiful than a picture can you, eve those high def. ones.The surreal scene, the calm amongst the crowd is very fictional yet true. You can feel yourself breathe every bit of it. The pleasure of being there was so ecstatic that it gives me thrilling goosebumps while writing this piece. 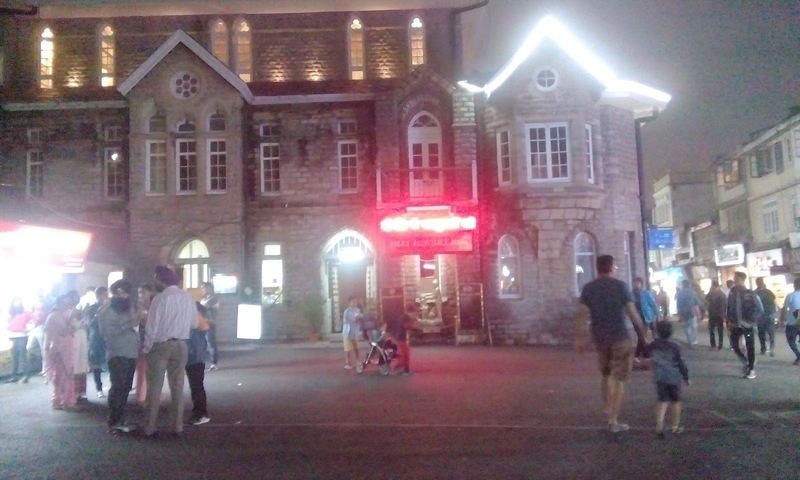 Its a place to visit, if you ever want to go to shimla do give it a shot, evening would be perfect time to be at this place,filled with people lots of them and yes you can shop too. The market has all the big names showcasing their merchandise. After a long wandering, we decided to stop by an icecream parlour and enjoy the chill of desserts it offered. The taste of dessert was like cherry on the cake.A little food in a local restaurant was decent if not the magical but it filled up our stomach, we bought a bottle of rum, decided to gulp two shots each while returning back to our hotel. While returning we shopped for our little ceebration and went back to our room making plan for the next trip. Lots of plans were sketched and when guys plan for their next trip, Goa shoots up to the top spot and mention of goa ended the planning with a chuckle and unanimous agreement of Goa as next place to visit. As we reached our room the inevitable happened.Every group has a friend who brag a lot about his drinking capacity and ends up throwing up after two shots and ruins the party for other.It happened to us and the blame was mulled to the previous shots that we had while returning back.After a long session of next day's plan over sip of whiskey, we were quite aquainted to each other and decided to sleep. My friend's decided to sleep and I took my diary and sat near the window. The chill of the wind was giving me a high of different level while I was interacting with my diary. After writing my day's experience, I decided to to sleep and rest as I wanted to dream my next day before the day arrives. As soon as I went to the bed, sleep was all over me in no time. Thank you for your response and with hope of similar response and constructive critique to this piece, I will see you in the final part of this narrative soon. Second semester of Masters at NIFT, New Delhi was about to start and a long weekend of 15th August was nearby. And yes I believe 15th of August should be celebrated by doing whatever you want to do, staying at home and sticking your face to DD national is not proof enough of your Nationalism. A friend used to live nearby my place during those day and his place was my second home.You could have found me at his place most of the time, eating, sleeping say,Living. As soon as I reached home, I got a call from him asking me to reach his place asap.He used to do that always,gives you a call and ask you to be at his place asap, Nothing Further.What this does to you is elevate your curiosity and you just cant stop yourself to be at his place,how disgusting it may look though. Pretty Smooth!! So my curiosity took me to his place and i was greeted with a plan of drinks and chicken and it is what i never say NO to. After a good long greet and meet with him and his flatmates I was introduced to the plan of a trip to Shimla. Being a Pahadi, this plan looked gravely boring to me. To my displeasure, I was inducted to this trip without my consent. 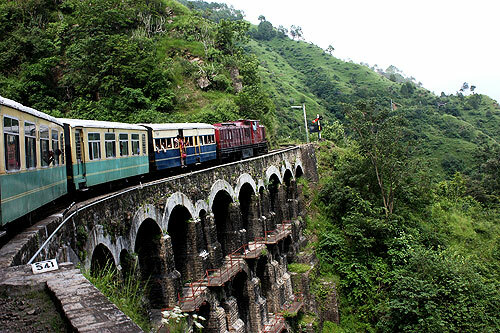 The plan was made, tickets were booked, first from Delhi to Kalka, which cost us 270 INR for a distance of 268 Kms and the boarding was scheduled 9:45 PM and the majestic and historic toy train ride to Shimla. It was evening of 13th of August, the sky of Delhi was covered with black clouds and we boarded metro to Kashmiri gate it started raining. It felt like a good omen to me, a good sign of what was awaiting for us all in Shimla. At Kashmiri Gate, I met with our third partner to Shimla, He looked decent and friendly. Although I am very chilled out but my introvert instincts always have another set of suspicious eyes. I was reluctant till my friend slept and we started having a conversation and we got to know each other a lot better and my suspicious instinct took a back seat. The trip to Kalka was crazy as the bus dropped us 4 Kms away from the railway station at a chowk around 3 o' clock in the morning in the dark.Street was dead,not ever dogs were barking.We just prayed someone to show up so to get the directions and miraculously(i seriously don't know how?) night watchmen showed up, banging his stick on the road. I cannot tell it just sparked faith for god in my atheistic heart. Frankly if I would have been a little less atheist, today you would have found me writing about Gods,ISKON etc. Thankfully that is not going to happen, atleast in this life and if there is no re-birth, I am dying an Atheist. So we asked that watchman direction to the railway station and not surprising it was 4 Kms from our location. the walk to station was very scare as it was dark.I would suggest to carry a flashlight or a phone with a flash,which i didn't had that time.When we reached station it was dead silent and we laid our little bags on the benches and waited for the tea shop to open.In an hour the Toy Train arrived at the station so does other passengers and arrived the bad news that mine out of us three, reservation was not confirmed. We went to the TC regarding our problem and he suggested me talk to the TC of the shift regarding the problem and the issue would be resolved.Keeping his suggestion in mind we board the train,it was chaotic.All seats were occupied and people without tickets were seated on the train.Everybody was confused and then we heard a firm voice "Jiska reservation nahi hai wo sab utar jao warna mein raste me utaar dunga". (Step out of the train if your ticket is not confirm or i ll kick you out during the journey"). In came the Punjabi middle aged man clad in a suit, he was the TC of the shift. Everybody was out within minutes and we got to our seats. he started asking for ticket and we flashed him with our tickets and seeing one unreserved seat, he demanded 50 rupees for the seat and offered me the seat.I paid hesitantly and owned the seat. (book your tickets before hand, seat get occupied pretty fast or pay 50 rupees extra). The engine whistled and the journey began and believe me you people, being a pahadi I should never feel so astonished to see the mountains but surprisingly i was thrilled. This is so much better, I said to myself. The scenes were so serene and appealing that I could hear my heart saying "you belong her, in these mountains". It was just majestic,gripping and just makes you high to a different level, you would never want to come back to normal.There was a stoppage and people took morning snacks,tea for refreshment.Then started the selfie session;selfie with train,engines were taken in large nos. and then again the train started moving on and the feeling of belonging came back and i just got married to the thought of settling in Shimla was impregnated to mind by those mesmerizing scenes. A five hour sensational journey ended and I was disappointed just by the thought that it was ending and we need to get off the train. Just when I started to feel disappointed, the Rain of Shimla at the station brought me back to life and taught me a lesson: Be Patient, You will be Amazed and Amazed I was to see why Shimla is a place to be, Twice a Year. There is more to this narrative but its for another time. Till then, Keep Traveling, where you always want to. A new beginning was set up for a person like me yet i was not very sure of the fact that i was ready for this new and fresh start . taking admission to a college not preferred by boys i was about to get. college of home science was itself a demoralizing by its name. but there i was to enter. most of everything was like the same as in Delhi just a new ways of living your life around lots and lots of girls.they were here there and everywhere and the most shocking thing was - there were no sign of a male student. I was happy to see girls all around but there was a feeling or a thought you can say that how am i going to manage among all these. a person so down like who had a choice to go for journalism or keep doing a hons. in English chose a college only meant for gals. and biggest tragedy happens when you are at these kind of places with your parents and they seem more confused than you. ain't it??? I looked at mom and her face seemed to me like a big question mark. she asked-"what if you are the only one to get admitted??" yes that was funny question..and it was revolving all over my head the whole time.without replying her as i never had any for the question we moved inside . to my amazement there were no male professors either. now that was fantastic is what came to my mind that moment. there were two ladies sitting at a kind of reception desk. we went to them as they allotted me an ADVISER ( a person who has got every right here at pantnagar to screw you at any moment , any time ; if you try to defy her ). with the definition of adviser lots of pantnagarians might agree. lets get back to the story..
so the name was shahnaz jahan. oh i beg your pardon it was prefixed with a DR.
hence its like DR. SHAHNAZ JAHAN (please don't ask me how many times did she screwed me in last 4 semesters). now as we moved towards the fee counter i was so relieved ( or heart broken you can say ) to see another guy in total black outfit.